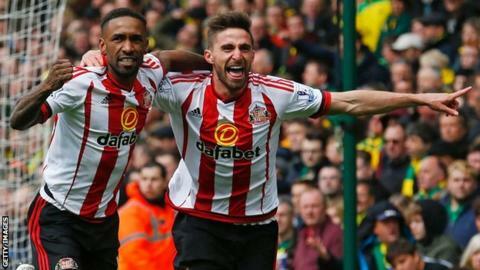 Sunderland climbed to within a point of safety by beating relegation rivals Norwich at Carrow Road. At the end of an even first half, Fabio Borini buried a penalty following Andre Wisdom's rash challenge in the box. The Italian put in an excellent cross for Jermain Defoe to turn in a second after the break before Duncan Watmore scored a third in injury time. Nathan Redmond hit a post and Norwich had penalty appeals turned down - but the comeback never gathered real pace. Instead Sunderland could easily have increased their winning margin before Watmore darted onto fellow substitute Sebastien Larsson pass and finally made the hosts pay for the space left behind as they committed numbers forward. Sunderland rely heavily on Defoe for goals. Fortunately for the Black Cats, he has managed 16 in 30 games this season and they had success as they repeatedly tested the Norwich defence against the 32-year-old striker's pace with long balls forward. It may have been one-dimensional, but that direct style paid off as Borini chased up on a swift counter-attack and was clumsily fouled by Wisdom in the box as he controlled Defoe's return ball. After the break, another fast transition after a dawdling Sebastien Bassong was robbed by Jan Kirchoff saw the roles reversed with Borini threading a perfect delivery to the far post for Defoe to slide in and convert. Sunderland's goal difference is now seven superior to Norwich's and they might have increased that advantage further with Watmore wasting a fine opening before belatedly adding a third. Norwich had 19 shots to the visitors' eight and 14 corners with Sunderland unable to force a single one. But for all their industry, endeavour and possession, they lacked the cutting edge and ruthlessness that the Black Cats showed. Norwich's shots (left) came from distance while Sunderland's (right) were fewer, closer in and more clinical. Instead they were largely restricted to long-range efforts, with Martin Olsson, Bassong and Wisdom bringing saves out of Vito Mannone. Redmond then struck the base of a post with a skimming effort, while referee Andre Marriner turned down a trio of weak penalty claims to the home crowd's disgust. The two clubs have competed for the Friendship Trophy in their league meetings since they played each other in the 1985 Milk Cup final, but with the far greater prize of Premier League survival on the line there was little cordial about this encounter. Norwich's Robbie Brady nudged DeAndre Yedlin into the advertising hoarding in front of the Sunderland bench, sparking a shoving match in which Black Cats' boss Sam Allardyce and Norwich substitute Cameron Jerome jostled each other. Relations were not improved by Borini's goal celebration which finished with him sliding on his knees in front of the home supporters, some of whom returned fire with the paper clappers that had been distributed before kick-off. The closing stages of the match played out to the travelling fans' taunts that Norwich are heading to the Championship with their north-east rivals Newcastle. If that prediction proves true, this result will feature heavily in Norwich's post-mortem of the season. Norwich boss Alex Neil: "The two teams are still chasing us, we're still a point ahead. We need to win games and that's always been the case. "That second goal cost us the game. The second half, for that first 25 minutes we looked threatening, hit the post, and I thought we were going to score but that second goal took the stuffing out us." Sunderland manager Sam Allardyce: "The position we've left ourselves in was making me feel a bit edgy this morning. Will we handle the pressure? Will we cope with the pressure? "They've answered my questions. They've coped with the pressure and coped with everything Norwich could throw at them. To come here and win 3-0 shows you what a massive result it is." Norwich have conceded nine penalties in the Premier League this season, the highest tally in the division. Sunderland have scored each of their past 17 penalties in the Premier League, last missing one in December 2011. Only Sunderland in 2007-08 and Bradford in 1999-2000 (nine) have conceded more penalty goals in a Premier League season than Norwich this season (eight). Jermain Defoe has now scored 10 goals in 14 Premier League away appearances this season for Sunderland. Defoe has scored or assisted in four of his past five Premier League games against Norwich (two goals, two assists). Sunderland scored with all three shots on target in the match. Sunderland won at Carrow Road for the first time since March 1985, having gone 10 games without a win there since. Both teams play Arsenal next. Sunderland welcome the Gunners to the Stadium of Light on 24 April, while Norwich have a fortnight to prepare for their trip to north London. Match ends, Norwich City 0, Sunderland 3. Second Half ends, Norwich City 0, Sunderland 3. Corner, Norwich City. Conceded by DeAndre Yedlin. Attempt missed. Wes Hoolahan (Norwich City) left footed shot from long range on the right misses to the left. Offside, Norwich City. John Ruddy tries a through ball, but Cameron Jerome is caught offside. Goal! Norwich City 0, Sunderland 3. Duncan Watmore (Sunderland) left footed shot from the left side of the six yard box to the bottom right corner. Assisted by Sebastian Larsson with a through ball. Attempt missed. Gary O'Neil (Norwich City) right footed shot from outside the box is too high. Assisted by Wes Hoolahan. Attempt missed. Cameron Jerome (Norwich City) right footed shot from a difficult angle on the right is high and wide to the right. Assisted by Wes Hoolahan. Attempt blocked. Jonny Howson (Norwich City) header from the centre of the box is blocked. Corner, Norwich City. Conceded by Lamine Koné. Attempt blocked. Nathan Redmond (Norwich City) left footed shot from outside the box is blocked. Assisted by Wes Hoolahan. Corner, Norwich City. Conceded by Vito Mannone. Attempt saved. Nathan Redmond (Norwich City) right footed shot from outside the box is saved in the top centre of the goal. Assisted by Wes Hoolahan. Foul by Jan Kirchhoff (Sunderland). Substitution, Norwich City. Cameron Jerome replaces Steven Naismith. Jan Kirchhoff (Sunderland) wins a free kick in the defensive half. Attempt missed. Sebastian Larsson (Sunderland) right footed shot from outside the box is close, but misses the top right corner from a direct free kick. Foul by Gary O'Neil (Norwich City). Offside, Sunderland. Jan Kirchhoff tries a through ball, but Patrick van Aanholt is caught offside. Substitution, Sunderland. Sebastian Larsson replaces Yann M'Vila. Offside, Sunderland. Yann M'Vila tries a through ball, but Jermain Defoe is caught offside. Attempt saved. Wes Hoolahan (Norwich City) left footed shot from the centre of the box is saved in the bottom left corner. Attempt blocked. Dieumerci Mbokani (Norwich City) header from the centre of the box is blocked. Attempt blocked. Dieumerci Mbokani (Norwich City) right footed shot from the centre of the box is blocked. Assisted by Steven Naismith with a through ball. Offside, Sunderland. Duncan Watmore tries a through ball, but Jermain Defoe is caught offside. Substitution, Norwich City. Wes Hoolahan replaces Matthew Jarvis.